Brushable elastomeric acrylic waterproofer for roofs with long lasting durability. Creates a white protective membrane with excellent adhesion to the substrate. Due to its high modulus of elasticity, it can absorb intense expansions and contraction,without the necessity for additional reinforcement (mesh). 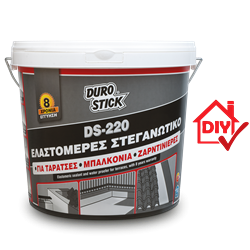 It protects surfaces from moisture that can adversely affect concrete rebars. Distinguished for its excellent resistance to extreme weather conditions, maintaining its properties at temperatures from -30°C to +90°C. Once dry, the product is walkable without sticking. Presents excellent covering and bridging of existing hairline and capillary cracks and prevents their reappearance. Exceptional durability to standing water. Apply it easily on flat and sloped roofs that will be lined with clay roof tiles. Apply it on corners and edges, lead lined roof valleys, balconies and built-in planters. Classified a product for surface protection of concrete surfaces per EN 1504-2.